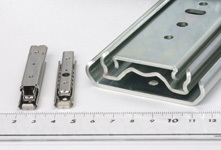 Slide rails are installed in areas with limited space, and are used as a linear motion component for a variety of product and unit applications. Our standard line up includes steel parts (trivalent chromium plating), as well as stainless slide rails, and we have enjoyed long-standing patronage in various markets. 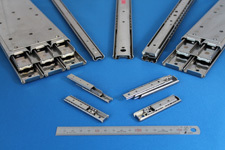 Please feel free to contact us about your linear motion component needs. We provide Stainless Steel Slide Rails for use in special environments (high temperature/humidity, corrosive), and they are manufactured for long life. Please contact us if you are looking for slide rails for use with food/beverage showcases or in kitchens. 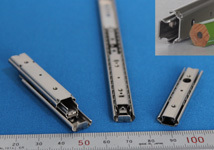 The U1000 series - the world's smallest class of slide rails, are compact with a width of 10.6mm and a height of 5mm, and are used in areas designed with restricted space. 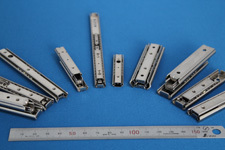 We also handle a variety of small slide rails other than the U1000 series. 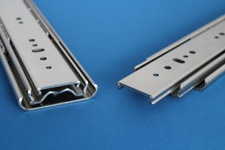 Mini rails with widths of 14mm, 16mm or 20mm can be designed for use in areas with limited space. Among our three types of slide rails, these are the largest slide rails we offer - the C690 series - with a width of 69.8mm, a height of 19.8mm and a load capacity of 1,400N. These are ideal for heavy loads.